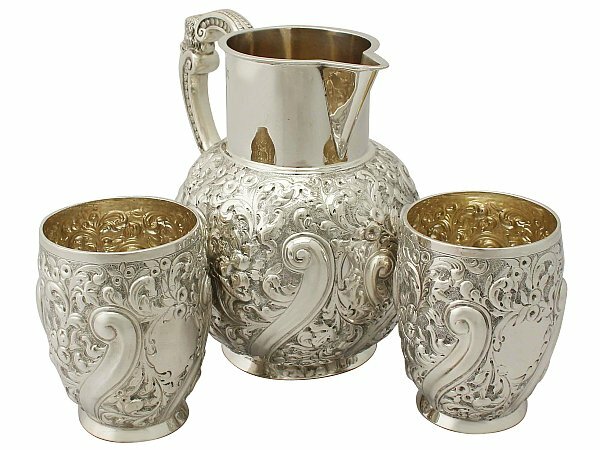 This exceptional antique Victorian sterling silver set consists of a jug and two beakers. Each silver beaker has a circular rounded form, whereas the antique jug has a globular form to a plain cylindrical neck; each piece is supported by a plain tapering collet style foot. 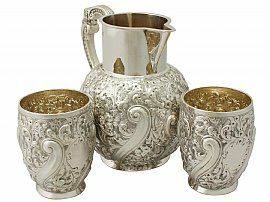 The impressive antique Victorian jug and beakers are embellished with exceptional chased scrolling leaf and floral ornamentation, all on a matte background. The decoration to each piece is segmented with large flutes with spiralling terminals, all in a swirl design and incorporates a shaped vacant cartouche to one side. The upper rim of the jug is encompassed with an applied moulded border. The jug is fitted with an exceptional C shaped handle ornamented with a ribbed scaled design to the upper portion and floral motifs to the lower portion, conjoined with a central bearded figural mask. The upper terminal of the handle is embellished with a lobed leaf design and the lower terminal features an exceptional claw design. This versatile Victorian jug and beakers could be functionally used for wine, cordial or water. These Victorian silver beakers retain the original gilded interiors. The underside of each piece features the retailer's mark Z. Barraclough & Sons, Leeds. The full hallmarks to the surface of the each piece are all clear. Reflections in photographs may detract from the true representation of these pieces of antique Victorian silverware. Length from back of handle to tip of spout 18.1cm/7.1"